Alberton is a busy place all year long. Here you can get a glimpse of the annual major events in Alberton, so come and check them out! Held in the early part of the year, the Alberton Winter Carnival is lots of fun for the entire community. There are pool, bowling, curling and dart tournaments, an around town scavenger hunt, pancake breakfasts, children's activities and ice sports, family fun skates, the Fancy Dress Skate, and an adult dance. The Winter Carnival is a great way to spend your winter days. Alberton celebrates Canada Day with a flag raising and cake cutting ceremony, children's games, West Prince Graphic Fishing Derby, local entertainment, many tournaments, and a barbeque. There is a full day of activities planned to celebrate our nation, so come and check them out! In late July, the whole town comes out to celebrate the Town with Alberton Days. Main Street is blocked off to traffic and there are several activities that take place in the street such as children's games, sidewalk sales by businesses, local live entertainment, a home-run derby, fashion show featuring area businesses, Lion's Club booths, a BBQ, and a dance right on Main Street open to everyone. The Miss Alberton Pageant is also held during these days. This Festival has many events and is an exciting scene to take in. 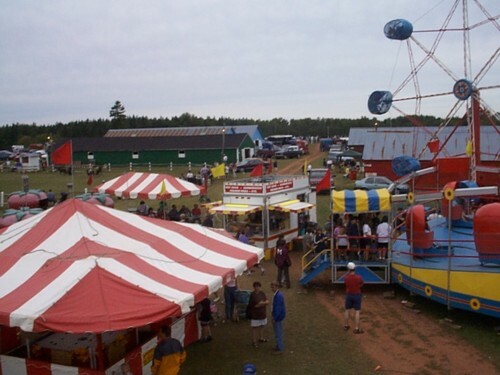 The Prince County Exhibition has always proven to be one of the major attractions in West Prince throughout its many years. It was started in 1926 and is held on a Thursday, Friday, and Saturday in mid-summer. All events occur on the fair grounds located on Church Street, Alberton. There are many events and attractions that take place during the Exhibition such as the strongman and youth talent competitions, a horse pull, a miniature horse show and harness racing. There is also live entertaiment and booths set up in the adjacent Jacques Cartier Arena which is open to the public for the duration of the Exhibition. The Saturday morning parade is one of the most popular and largely attended events featuring many enteries such as floats, bands, antique cars, tractors, emergency vehicles, and much more. The exhibition is a great place for kids as there is a kids day with games, prizes and treats. There is also a midway with rides that are appropriate for all ages. There is so much going on at the exhibition that it is impossible to mention it all! So come out and enjoy the fun, you certainly won't forget it! Pictured above is a view of a portion of the grounds of the Prince County Exhibiton. Several rides from the midway can be seen and in the background, barns and a ring where animals are judged and can be viewed by the public. The Alberton Santa Claus parade is held in early to mid-December. The first ever Alberton Santa Claus parade was held in 1996. There are a variety of Christmas themed floats entered in the parade and several other enteries to see. After the parade, Santa is available to visit with children as well as hand out treats.